Khaleejesque, the first, and only worth checking, khaleejy (Gulf) lifestyle e-zine has turned two! The Khaleejesque team celebrated their anniversary with a much earned elegant, two tiered cake. The Oven Experiments would like to wish the lovely team many more returns and lots of beautiful cakes! 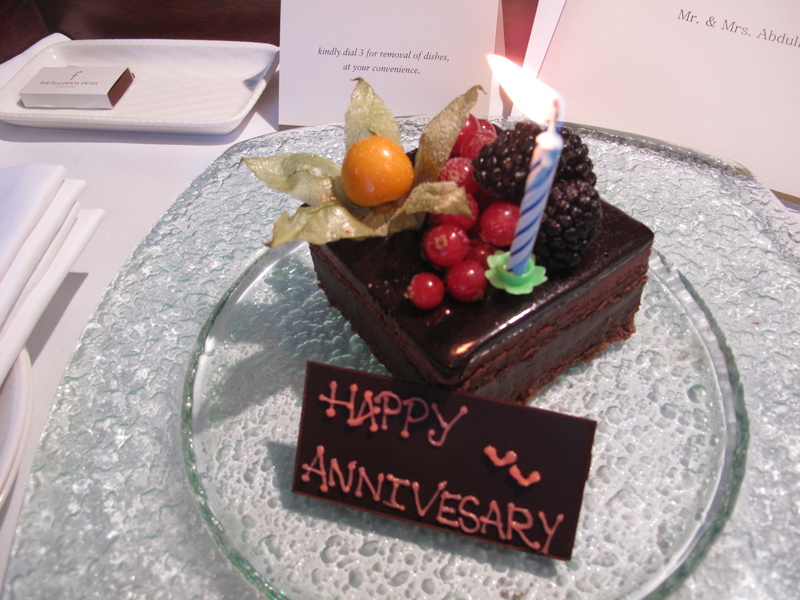 When my parents arrived in Singapore, it was also their Anniversary date! So it was a win-win trip. I get to have them as company and they get to celebrate their anniversary! I was dealing with the Hotel a lot, since we had an official delegation coming. I told them that my parent’s were coming for their anniversary and they generously offered to have a bouquet of fresh flowers and a cake delivered to their room on their arrival. And this was the cake. It was De-Li-Cious! It reminded me of Opera chocolate cake with the crispy cereal inside. Although it does seem small but it was quite filling. We were eating it for two days! In case you’re wondering, we stayed at the Fullerton Hotel. I highly recommend it.